This Kadey Krogen came to us well equipped and well cared for. Our only concern was the amount of time it had been tied to the dock because neglect can sometimes cause more issues than heavy use.. We immediately started to plan the implementation of the lessons we had learned from our previous experience. Also, the boat was using 2004 technology, materials and processes. Working on boats is nearly as fun and rewarding as running them. Let the fun begin! This hatch was hard to open and would drop to hard. One of the first tasks was to gather the email addresses of other Kadey Krogen 39 owners and ask for help. The responses were very helpful and some owners did not have a gas strut which indicated that these were installed after production. The new strut was made by the same manufacturer of the failed one, American Tool, only the length was increased so the hatch would be nearly vertical and the pounds of air pressure was increased from 30 to 40 pounds - all based on the experience of other owners. A strap was added to the handle to make closing the hatch safer and easier from the first step of the ladder. Tribute lives in the Pacific Northwest where the summers can be sunny, the fall and spring can be cool, breezy and wet and the mild winters are just plain wet and cloudy between storms. The cockpit was a huge selling point for us and it need additional protection. Walking the docks and listening to boating friends provided the guidance we needed. We used InCanvas, an Everett=based small company, that has earned a reputation for quality and using newer materials. The fabric is a vinyl and the windows are a bendable polycarbonate. The elastic tie downs are hidden by a flap. All of the panels can slide open and the two larger side panels can also lift up and be secured inside. This has easily endured 40+ mile per hour winds and heavy rain and kept it all dry. Cleaning is done with a cap of Woollite in a gallon of water, using a clean microfiber towel and rinsing immediately with clean water. These are a headset and microphone combination that allows a seamless two-way conversation without the need to depress a talk or transmit button. We were skeptics and probably were critical of those who used headsets to talk with each other. Now, we are converts and view these as an essential tool for a successful docking and maneuvering in tight quarters because we are often out sight and hearing range from each other. Our definition of successful docking is no yelling, no jumping and no hurt feelings. Gelcoat can be fixed easier than repairing a relationship. The design weakness of this product is the cables can accidently be pulled and can break the connection. 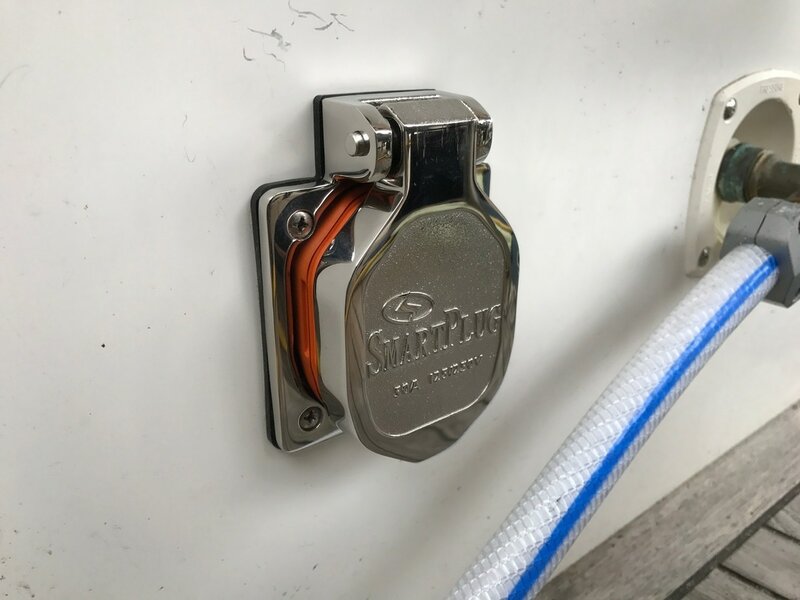 We overcame that issue by adding adhesive anchor points for cable ties that are available from a hardware store and securing the mike cables to the anchor points. On the Great Loop, we became addicted to the benefits of having AIS integrated into the chartplotter. We could “see” the position of commercial vessels and their direction and speed and therefore could plan to avoid them. As important, we had the option of transmitting our position, speed and description so others could “see” us. Having AIS that transmits and receives was the goal. Tribute’s 2004 vintage Furuno system is fully functional but is closed in the sense of not being able to add more functionality. There were two options: replace the entire navigation system or add a stand-alone system. Price drove us to second option. The solution. 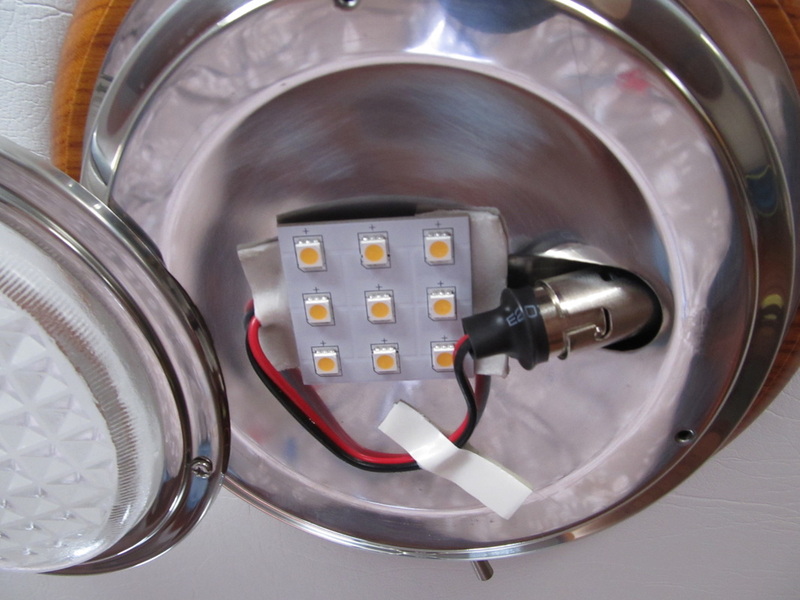 Vesper Marine’s product is a small blue-colored component that was wired into the same power supply as the VHF radio. Therefore, when the VHF radio is on, the AIS functions. Their antenna splitter option was used to eliminate the need for another antenna, another deck cabin penetration and all the cabling. The Vesper blue box communicates to an iPad via WiFi. The iPad needs the iNavX application and charts that are distributed by them. The hour-long install of the blue box was easy. The fault codes on the blue box identified an electronic noise issue that was solved with clamp-on ferrite anchors. INavX was easy to install and though many charts were free, we opted for the charts by Navionics because they are redundant to the ones that we keep on our iPhones. 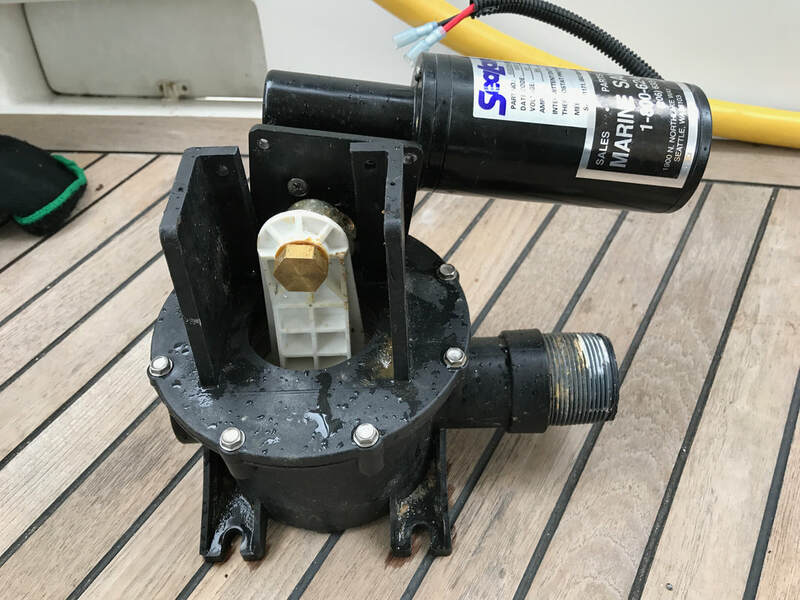 Now, the iPad remains plugged into power with a small inverter feeding a plug bar and it sits on the conventional reading stand because we use it in the pilothouse. Tribute has lots of opportunities for storage and some of them are more accessible than others. The huge space under the cockpit is easy to get to but is very deep and therefore difficult to effectively use and is easy to lose stuff in. Rather than building a fixed set of shelves or trying to engineer a set of bins that could fit onto the angled shape of the hull, the solution was three five gallon buckets that supports a plywood platform. With large holes to closely match the buckets, these made three bins and the platform with short sides became a shelf that was large enough and high enough to contain the important things within easy reach. Yet, the whole assembly was small enough to allow all storage along the sides for longer items like folding director's chairs and the boat brush. On a 5 point scale of difficulty, this was a 2. Like most ideas, this was unapologetically stolen from another boater. This is a battery operated digital thermometer with a remote sensor. 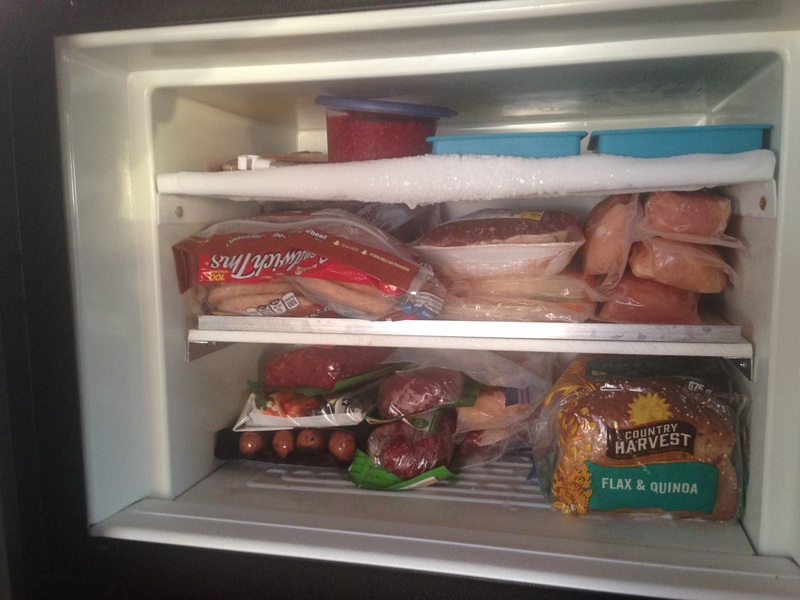 The remote is in the engine room because heat is one of the early warning signs of something that is amiss. When the heat is more than 25 degrees than the pilothouse temperature, with a maximum of 120 degree, a second look is warranted. The engine room is checked about every hour or so and because there is a window in the door to the engine room, a preliminary visual check is easy to do. Hearing protection is on a hook outside the door for the next step in monitoring the Holy Place. 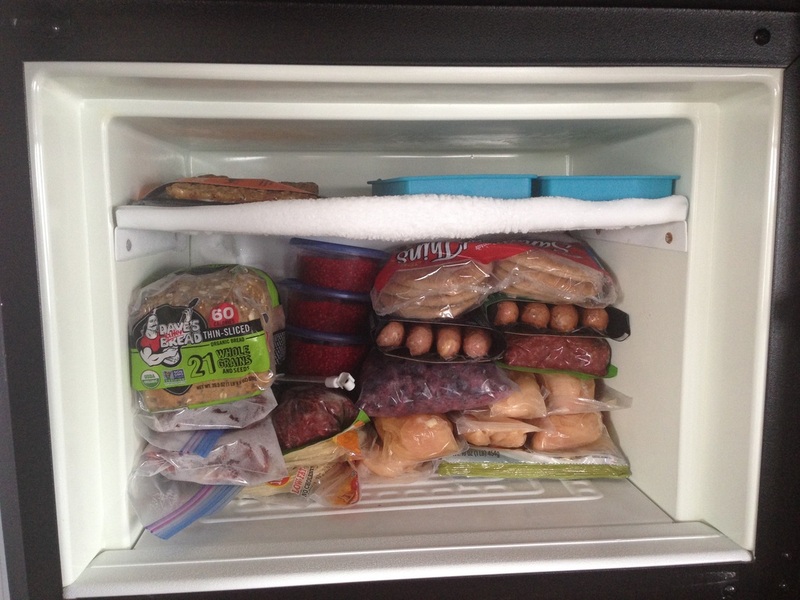 Adding a shelf to the freezer was an easy job. 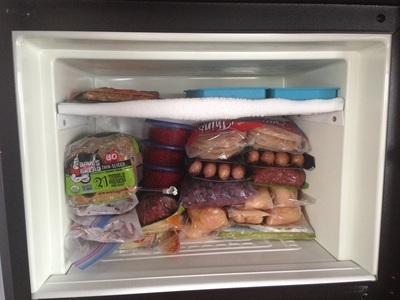 Made of starboard and aluminum angle material that creates a lip and is screwed into the starboard and the walls, the organization of the freezer became easier. On a 5 point scale of difficulty, this was 2.5 to get the fit right. 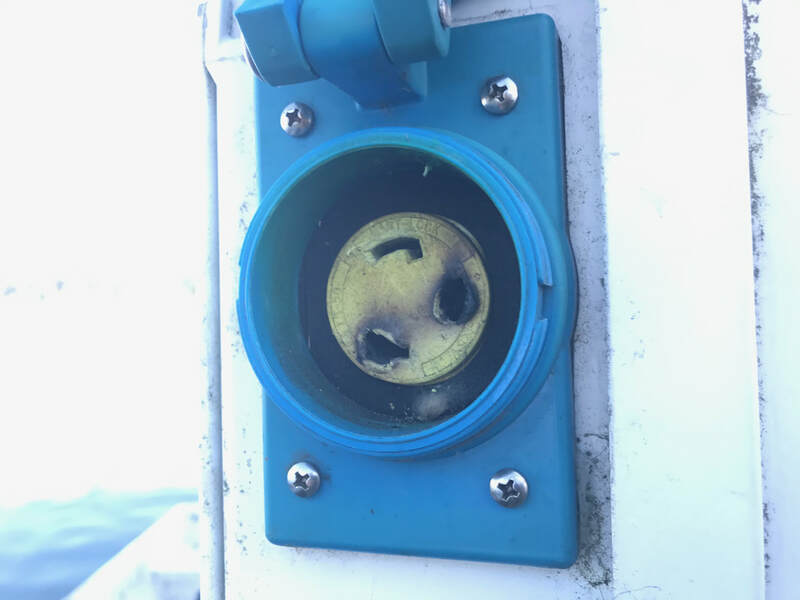 Though the magazine articles were read and the endorsements were heard, changing the connections of the shore power system to the Smart Plug technology did not happen until a neighbor of ours narrowly avoided having an electrical fire on their boat. The cause of fire on a boat is often electrical and the connection between the shore power cord and the receptacle on the boat is often the culprit. Tribute’s AC electrical system will take 50 amps of power with a 4-wire plug but the shore power cord was only 30 amps and a 3-wire system. Therefore, the cord was often carrying close to its capacity. 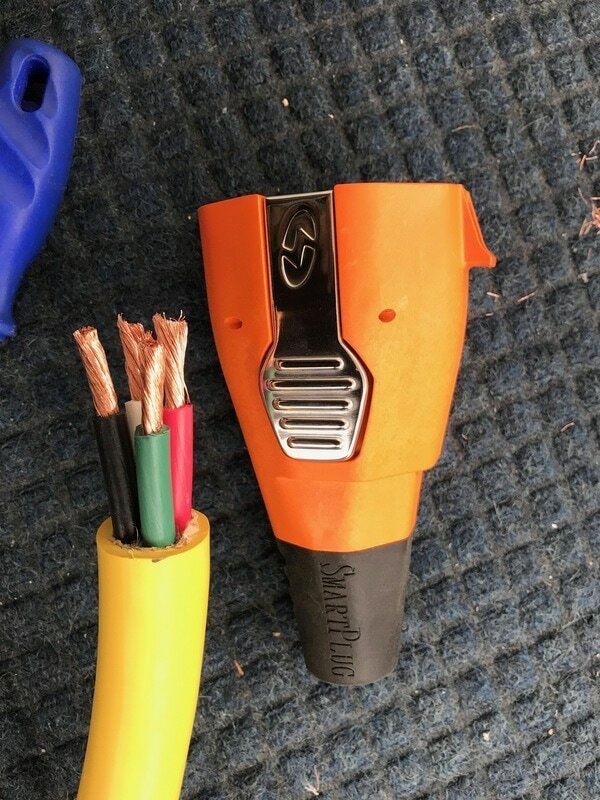 The first fix was replacing the cord with a 50 amp, 4-wire cord. Smart Plug does not offer a 50-amp cord, so the plug on the new one was cut off and replaced with a Smart Plug. Tribute’s two exterior receptacles were easily replaced. The whole job took about two hours and on a 5-point scale of difficulty with 5 being the highest, this was a 2. Smart Plug’s instructions were the best written and illustrated. The photo below and on the right is the charring of a receptacle on a shore power pedestal; a horrible outcome waiting for the next boater. This is diesel-fired boiler and circulating system that sends hot fluid through the water heater and registers throughout the boat that creates a comfortable and even heat. 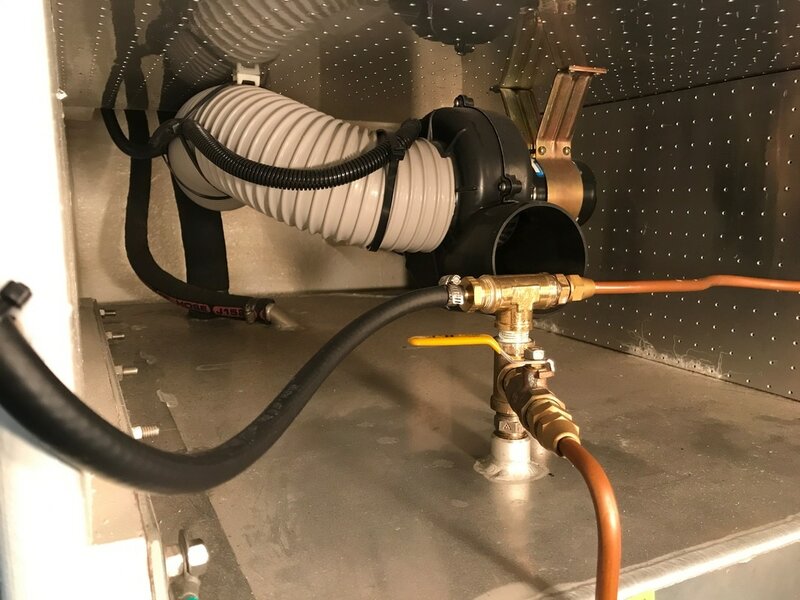 The installers of this hydronic had fuel pulled from the main fuel tank which eliminates the need to fill a separate tank and carrying cans of diesel from the fuel dock during the winter. The system was initially reliable but soon there were issues that in retrospect, was age-appropriate repairs and maintenance. The first issue was the unit did not reliably start its combustion sequence. A call to the manufacturer, ITR and their office in Vancouver, Washington resulted in a great and helpful conversation. Together on the phone, the unit’s control box was accessed, the controller was bypassed and the resulting performance yielded a solution that the igniter needed replacing. The ignitor is easily removed and replaced. The second issue were flameouts or the system shutting down when the diesel stopped igniting. The manual said the cause was probably air in the fuel line and the fix was bleeding the fuel line. 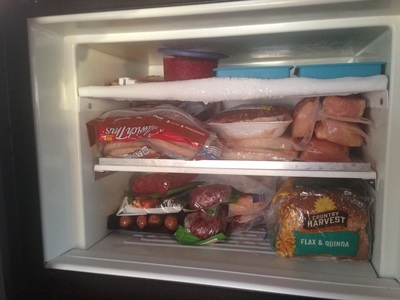 The flameouts occurred nearly daily and the system was bled and re-started. 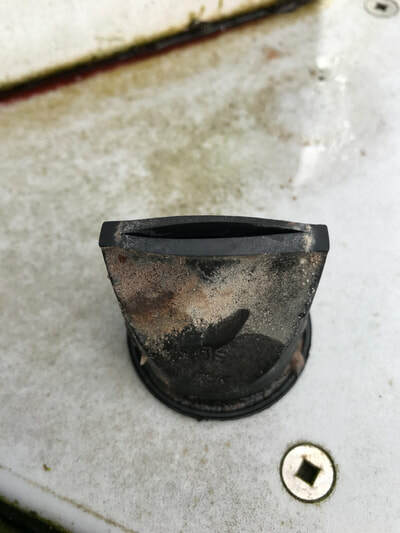 Thinking it was chronic air in the line but the cause could not be found, another owner suggested that the bleed tube be routed back to the fuel tank by way of the fuel return line. The result: some improvement but not a fix. 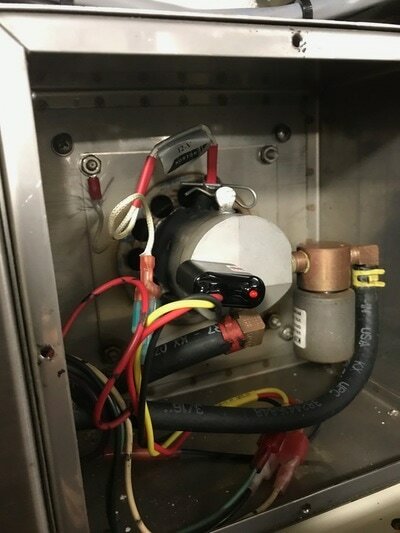 Another call to the manufacturer provided the quick assessment that the flame sensor, a photo-eye component, needed replacing. Again, this was easy: unscrewing the old one and screwing in the new one. These two solutions are part of the normal repairs needed at about 1,000 hours. The third issue was an obnoxious noise from the combustion box. Again, the same employee at the manufacturer quickly diagnosed the issue as a failing fan. The replacement fan had a new design and I was provided with clear instructions on how to install it. The Hurricane unit has been reliable, quiet and effective. The design and workmanship make this unit easy for the comfortable DYI owner to do most repairs and maintenance. On a 5-point scale of difficulty, the most complex repair, was replacing the combustion fan when the bearing started to scream, was a 3. The photo on the left is the fuel line return system and T was added to accept the black-colored fuel line from the Hurricane unit. The photo on the right is the inside of the hydronic unit with the end cover removed. The igniter is at the top and behind the flat shaped thumb screw. The flame sensor is the black part with the small red light. Every month, the nozzle in the combustion chamber is easily removed and cleaned and the fluid reservoir is checked and filled as needed. Introduction: The heat exchanger is a long rectangular box that contains a cylinder or core that is perforated with holes and is about 3 inches in diameter and about 24 inches long. The ends are water tight with caps and two sets of re-usable O-rings. Inside the cylinder is about 30 small tubes. Raw water is pumped through the small tubes and engine coolant circulates outside the tubes. The cooler raw water cools the coolant and heat from the coolant is transferred to the raw water. The manual calls for the heat exchanger to be inspected every 1,000 hours because the small diameter tubes can be clogged by the particles in the raw water. Tribute’s engine temperature rarely goes above 185 degrees, not bad considering the coolant thermostat opens at 180 degrees. Servicing the heat exchanger was well within the skills of this DIY owner. The end caps came off easily and they were partially clogged. Gripping the edge with a pair of pliers pulled out the core. On a 5 point scale of difficulty, this was about a 3.75 because of the number steps needed to complete the job. The surprise was that half of the small tubes were clogged with debris and crystals. These were cleared with using a 3/16” diameter brass rod. This project was learned about from reading an article in BoatUS magazine and the owner's manual confirmed the need and the process. Replacing the anode should happen no less than every two years. One of the owners had the hot water lines coated with a a paint-on insulation and because this insulation had not been removed where the anode was, the anode was likely the original one. The new anode was ordered from the manufacturer and cost $54. The anode is located where the hot water leaves the tank. Most of the time was spent removing the paint-on insulation on the copper tubing and fittings in order to remove the plumbing from the tank. Water was drained using the high pressure relief valve. Using a pipe wrench, the old anode came out easily. This photo is what the old anode looked like. On a 5 point scale of difficulty, this project was a 1.5. Laurie noticed the odor in the head first and then the unusual and loud clunking noise when the toilet was flushed confirmed that he priorities of the day would be immediately changed. The Vacuflush system has two parts: the toilet and the box with a motor and bellows that creates the vacuum so all the liquid and wastes leave the toilet and are moved to the holding tank. 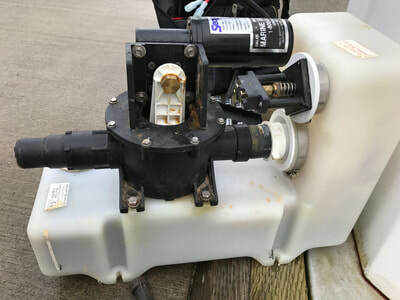 A call to Marine Sanitation in Seattle confirmed that the noise was probably a cracked bellows and they would have all the parts needed for this job waiting on the counter. The first part of the job was disconnecting the power and ground wires for the motor, uncoupling the PVC lines, unbolting the unit and putting it on the dock for the repair job. The internal components were nasty and were easily flushed with water. The cracked bellows came out easily after removing the motor and the top cap and the new one went in easily. The duckbills on each side of the pump were pulled and replaced because, as the photo shows, there were shot. In terms of difficulty, this job was about 4 due to the nastiness and the time needed though the work was very straightforward.